The Mitsubishi Cement Mine and Plant is the former Kaiser Cement plant, which was purchased by Mitsubishi in the 1990's. Mitsubishi Cement Co. owns and operates cement operations in Japan, China and the USA. 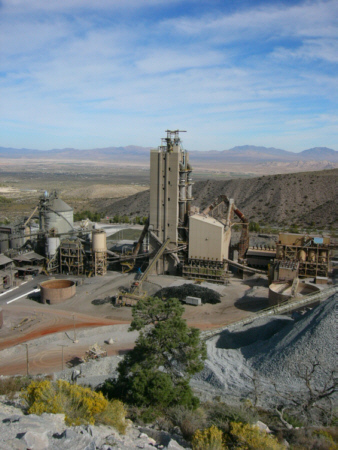 This mine provides Southern California, Arizona, Nevada and Utah with a consistent and high quality of cement products which are used for construction, roofing, and highways. Without companies like Mitsubishi Cement, the cost of everything manufactured from cement would rise dramatically in the local area, since transporting cement long distances can double or triple the cost of the cement product. Mitsubishi Cement is a good example of industry producing a high quality product for the community, while being a good neighbor, minimizing the impact of their industrial operation on the lives of the local citizens, employing several hundred of these local citizens in good high paying jobs, and being stewards of the environment, both in their operations and their reclamation of the site, once mining is completed. First, let's look at the process of making cement. Basically, cement is composed of four ingredients calcium carbonate (limestone), iron, silica and alumina. By blending these ingredients in the right proportions cements of differing characteristics are manufactured from the raw materials, which in this case are rocks or ore mined from the earth.